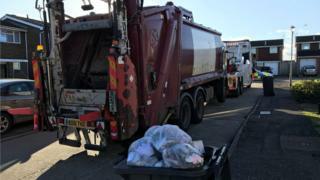 A binman has died following a collision with a bin lorry in Essex. The man died at the scene of the incident, in Osea Way, Chelmsford, at 09:05 GMT, Essex Police said. The force said officers from its serious collision investigation unit were sent to Osea Way, along with Chelmsford City Council. The council said the man was a member of its staff, and that the authority was "cooperating fully" with police. The Health and Safety Executive said it was aware of the incident and was assisting police with their inquiries.